The Draped Bust design continued into 1796. Production was hampered by poor dies, scarcity of silver bullion and lack of public support or even interest in a national mint. 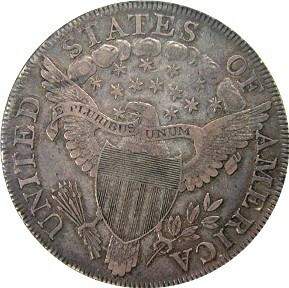 The 1796 date coins had a mintage similar to the 1795 coins, but this date is significantly rarer in grades above AU-58. Striking quality is typically poor, as on the Flowing Hair design, which will be a full grade weaker on the reverse than the obverse. Planchet quality on the 1796 dollars is inferior to the 1795 version. Most of these coins will show a lot of nicks and scratches. The problems which plagued the mint in 1796 became even worse in 1797. This year only, they had 16 stars to represent every state in the union at the time. Finding nice examples of 1797 Draped Bust silver dollars is really tough. The 1797 dollars are also difficult to grade because of their poor quality control. 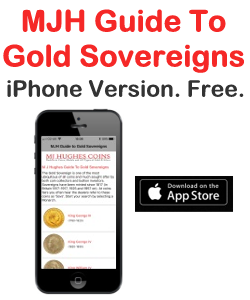 The most accurate way is to determine the detail on the device and note any remaining mint luster. The obverse should be weighted higher than normal in determining the grade, due to the general poor quality of the reverse. These coins are difficult to find in grades above VF-30. The 1798 Bust silver dollars are probably the most misunderstood issue in the Draped Bust series. Both the original Small Eagle and Heraldic Eagle reverse dies were used that year. Lots of varieties are represented for this year, including 13 and 15 star designs. 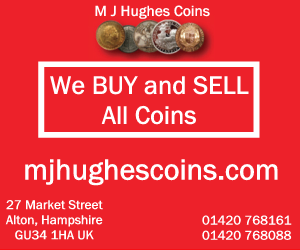 Around 7,000-8,000 coins survive from the original mintage of 327,536 and only two dozen of them grade in the MS-64 or MS-65 range. 1798 Heraldic Eagle dollars are much easier to find than their small Eagle counterparts. Striking quality varies greatly, but is generally slightly better than 1797. Grading these coins is still difficult, because the poor strike looks like wear unless you know the striking characteristics of this issue. As with so many of the early silver dollars, many have been repaired or restored. 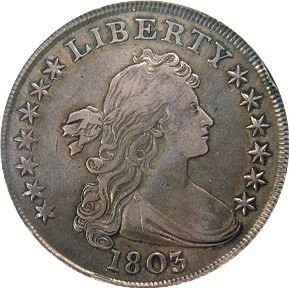 The 1799 Bust dollars are among the most common of the series. 423,515 were struck and as many as 8500-9000 may have survived. These coins are easy to find in EF condition, though AU examples are scarce and MS are rare. The year 1799 has more high-grade specimens than any single year in the Draped Bust series. The year 1800 is another relatively common date by the standards of the Draped Bust dollar. 220,920 were struck, and 4500-5000 still survive. Most will be found in low grades typically in About Good to Fine. The strike tends to be better than earlier dates in this series, though often weak at the centers. The 1801 mintage was 54,454 pieces, but there seems to be a fairly low survival rate. It is really rare in upper grades and probably the rarest date with the Heraldic Eagle reverse. 1801 dollars exhibit the typical weak strike of the Draped Bust series, especially lacking hair detail. As with so many dates in the Draped Bust series, this date also displays significant post striking damage. For 1802, the mintage was only 41,650. The date isn’t as scarce as the figure would suggest however, because some coins dated 1802 were actually struck in 1803 and 1804. The 1802 dollars exhibit the typical weak strike of their predecessors, especially on the obverse. 1803 Draped Bust silver dollars had a mintage of 85,364. Of those struck, 19,570 were released in 1804, with some of them dated 1802 as well. These coins aren’t as rare in high grades as the 1801 variety. Low grade examples are almost common, but pieces above EF are scarce. The 1803 Draped Bust dollars continue to be softly struck. They tend to look flat and mushy. The production of silver dollars stopped in 1804 and didn’t resume until 1836. Silver dollars were expensive to produce and demand for them wasn’t very strong. They were just too cumbersome to be practical for most people. The last of the Draped Bust dollar series was the 1804 with the Heraldic Eagle. It is one of the most legendary of American rare coins, and was actually struck in 1834 and again in the 1850’s. I will devote an entire future article on the famous 1804 Draped Bust silver dollar.